After a three-decade long hiatus, the Canadian outfit Midnight Vice has gotten back together, the core at least in Rob Furland and Rick Hart along with a new pack of members from their old neighborhood. 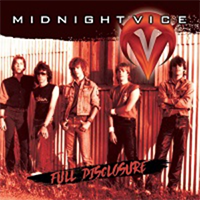 A new release followed in 2010, the first album release proper by Midnight Vice titled “Evidence”, here though in “Full Disclosure” we have an album compiled of twenty-two demos which dates back to 1983/84. This release can be seen as the band getting their original album out, or what they wanted as an album after a gap of thirty-plus years, however as demos go this is a solid collection which acts as a should-have-been the greatest hits, although there are doubles of three of the tracks, do not be mistaken for thinking this is merely a case of filling space they are different versions in their own right and give a greater scope to the power of the band. “Full Disclosure” kicks off with the Industrial-Metal guitars of “Sacred Trust Version I)” it is a very uneven but interesting affair with the guitar blisters we also get a bass solo midway, the vocals are upfront in the mix, no failure on the bands part as this is a demo after all. The second pass at “Sacred Trust” is a more honed version surprisingly though it loses a little of the raw energy of the opener. With “Arrow To The Sun”, an early version of “Vice Squad” we really start to get into a groove of quality, the original version appears further down the track listing and is still an excellently constructed blast of pre-trash Metal. With “For King And Country” and “After Me”, although solidly constructed they do suffer from a dip in sound quality which takes from the enjoyment although only slightly, “After Me” has a furious guitar-riff opening and the vocals are delivered in more a punk than metal manner, the green shoots of where this band were heading is on full display here. The ballad “Lead Picks(The Piece)” an instrumental number which is very Randy Rhoads in style, some parts bring to mind the opening of “Diary Of A Madman” but still a pleasant piece of music. Whereas castaway tracks such as the forty-four second “Croon The Blues” just seem to break-up the steady flow of the album and doing really serve a purpose. When we get to “Shanghai Battle Cry” which opens with the sounds of a war we hear Midnight Vice flex fully, this is a classic track with a huge drum sound, huge guitar sound and sweet pick-scrapes before changing tempo and speeding up. The vocals come in precise and fit perfectly into the destructive collage of sound, there is a second version of this track but it is not as heavy-impacted or fully formed as the first take. One of the standout tracks on the set is also the longest, “Time-The Victor” opens with an Eddie Van Halen style display of guitar-harmonics, the song moves to a gripping bass line all the while the cymbal taps keep us riveted, an instrumental which twists and turns through key changes and tempos allowing the band to showcase their power and musicianship. This release may be Midnight Vice building momentum before the release of new material, a solid testimony to their early days and although that uneven sound of raw demos can be enjoyable however, here it does let the an excellent band down in places.